Yogic breathing: chest to belly or belly to chest; what is the proper breathing technique? There is an ongoing discussion in the yoga community about the directionality of the breath – do you begin your inhalation in the chest and then fill the belly or do your fill up the belly first and then expand the chest? This seemingly innocent question can have yoga teachers argue till they are blue in the face. Is there a right answer? Yep, but before we get to it, let’s start at the beginning. First of all, let’s get our facts straight – we CANNOT breathe into our bellies (if the air does go into your belly, you are in deep trouble). You certainly do and should EXPAND your belly as you breathe in, but not because the air goes there. To understand the intricate process of respiration, we need to know two important facts. FACT 2: Lungs DO NOT have muscular tissue, which means that you cannot move your lungs at will. Instead the outer surface of the lungs sticks to the inner surface of the ribcage and to the top of the diaphragm; as a result, lungs get pulled following the movement of those structures. So you cannot move your lungs directly, but you COULD intentionally expand the ribcage and, to some degree, affect the movement of the diaphragm (because it is a muscle), which would move your lungs indirectly. When the air rushes into the lungs, they get filled all at once – you CANNOT fill the bottom of the lungs first and then the top. Oxygen is not liquid, it’s gas; therefore you cannot fill a container (lungs) from the bottom up, like you would with liquid. The degree of movement of the diaphragm and the ribcage can vary. During diaphragmatic or deep breathing we rely mostly on the movement of the diaphragm; it usually occurs at minimal levels of activity. During costal, or shallow breathing we rely mostly on the rib cage changing it’s shape and is more common during higher activity levels OR when the contents of the abdominal cavity restricts the movement of the diaphragm (for example, when there is a baby there). 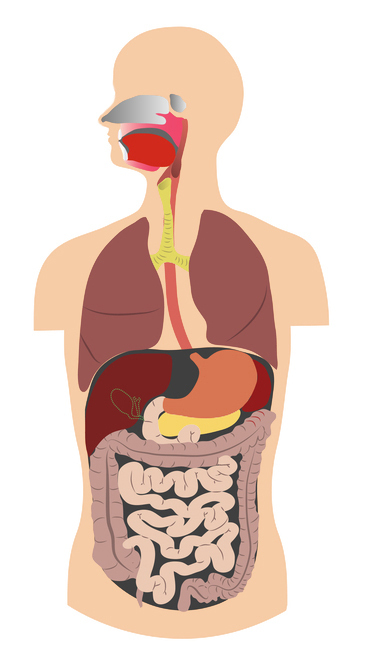 As you can see from this image, your abdominal cavity is packed with stuff – vital organs, digestive tract, etc. When the diaphragm moves down on the inhalation, it pushes down on your abdominal content and it has no other place to go but forward, so your belly pushes forward. Your exhalation can either be passive or active. With passive exhalation, the muscles that’s been contracting on the Inhale relax and return to their original position. With active exhalation you use your abdominal muscles to compress the abdomen and force the diaphragm upward. If you do your abdominal contraction in a gradual fashion as you exhale, it will help stabilize and support your lower back (read more about the progressive abdominal contraction). And of course, yogis were very interested in the energetic effects of the breath. Breath is a vehicle for prana, the vital force, that runs in different currents throughout the body. According to Bhagavad Gita, every breath cycle is an opportunity to link prana and apana – two primary currents of the life force. Apana, which is aligned with the force of gravity, moves downward resulting in elimination of wastes, as well as disease, aging, death and the diminution of consciousness. Prana, which is aligned with the air and space elements is meant to move downward and is responsible for everything we take into the body – food, water, experiences and information. But it can disperse upward through the mind and senses, especially in this age of sensory and information overload. This leads to loss of mind-body coordination and devitalization. Uniting these two primary vayus results in strengthening our energy along with awakening our higher faculties. 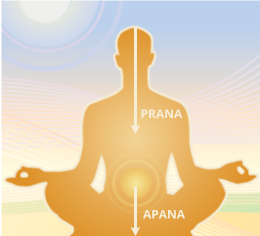 Yogic practices work to raise apana up to unite with prana and draw prana down to unite with apana, which occurs in the region of the navel – the pranic center in the body. To unite prana and apana, we would focus on the SYMBOLIC downward movement of the breath on the inhalation (nose – throat – chest – belly), facilitated by intentional muscular contraction, and SYMBOLIC upward movement of the breath on the exhalation (using progressive abdominal contraction from the pubic bone toward the navel and then compressing the rib cage). So to go back to our original question – what is the proper breathing technique – chest to belly or belly to chest – the answer is: It depends! It depends on what you are trying to accomplish. I am so thankful about this article. It’s the easiest way to explain the process of breathing and though I know how it works sometimes I don’t find the right way to explain it to my students. Something you didn’t mention and I am used to saying in my classes is pay attention to keep mulha bandha on during the process. Do you agree? Hi Beatrice! thank you for your comment. A conversation about mula bandha is an interesting one. Personally I am not a fan of holding the contraction in the pelvic floor ALL THE TIME. I know plenty of students who have trouble relaxing that area, so keeping it constantly engaged is not useful for them. Having said that, for some students it is easier to do the progressive abdominal contraction on the exhale if they engage the pelvic floor muscles as well. So you won’t hear me talk about engaging the pelvic floor nearly as much as I do about progressive abdominal contraction, unless, of course, it is the focus of the practice. But I think this is the topic definitely worth exploring; thank you for giving me an idea for a future post! As Beatrice says it explains the process in a simple manner. As a teacher I am always mindful of communicating in an effective manner, mindful of what and how I offer direction. I will definitely keep this article as a reminder of simple, effective communication on such an important subject. Before reading it I wasn’t even aware of the pressure subject and about the air filling the lungs all at once! I have a question about what you wrote concerning pulling the belly in on the exhale- which you wrote is not a good thing. In Pilates I’m taught to have the belly contracted- or to be more precise, to breath to the back and sides of the ribcage- on the inhale also so that I have a strong core that supports the back and pelvis while moving the limbs. So.. is it wrong to do so? Hi Katia, thank you for your comment! As to your question: I think we are talking about two different things here. During exercise, Pilates and yoga it is super important to contract the lower abdomen for support. Often we maintain this contraction on the Inhalation, too, to protect the lower back. Now in our daily lives it is not advisable to routinely hold the abdomen in, and even worse to pull it in on the Inhalation. Both if these can interfere with the natural breathing pattern and promote shallow breathing. Did I understand you correctly? Hi Christina! Thank you for bringing this article to my attention. I am a little puzzled by that statement since every doctor I ever talked to, and every anatomical article I ever read said that this is not the case. I will keep investigating! Maybe it’s new information (I was told it by an active lung physiologist researcher) or there’s just a widespread misconception because it’s taught like that so it’s easier to understand? My medical physiology course also taught us it was from the bottom and I remember being super confused by that because I couldn’t logic it. Of course the air has to go through the the top of the lungs to get to the bottom, but the bottom part of the lung expands first, so maybe people are just looking at the same thing and saying it different ways. ? Yes, this definitely requires further investigation. I would be interested in just understanding the mechanics of that… Could you please let me know if you run into other discussions on the subject? Sorry that this is so late to the conversation. It would appear based on the literature I’ve looked at (I am in your tradition!) that technically speaking the air collects at the bottom of the lung first. This is due to the fact that while the tissues are elastic, the rib cage has way more movement at the bottom which is where, as Christina points out, the lungs actually adhere. So the bottom of the lung moves first. This is, however, a completely different kind of conversation than one about how to ‘feel’ the breath. You still wouldn’t be breathing into your belly first, as the volume of air in the lungs must exceed the structural limitations of the rib cage in conjunction with the movement of the diaphragm if ‘a breath’ is going to cause displacement in the abdominal cavity. I had adopted the top to bottom inhale pattern in most asana because I find it the most functional. YMMV, as they say. I am always thinking of the best breath for playing my flute when I do pranyama. What I need for that is the quickest possible full breath, so I simultaneously rapidly expand my abdomen and pull down on my diaphragm. Then I need a very slow, strong and supported exhale, so I turn on core and exhale as slowly as I can maintaining a good steady volume of air. Multi-tasking! So it does depend on your purpose. Thanks for a great post. Re the bottom vs top of lung filling, I learned in medical school that the bottom parts of the lung exchange more oxygen than the upper parts. I presumed it was mechanical as there is so much more opportunity for physical expansion in the lower parts of the lungs. Thank you for your comment Sharon! Indeed, there is always a reason for everything we do (or it should be anyway :), including the type of breath we choose to do. Thank you for your contribution to our lung filling discussion – it makes sense! While Jo Key, (the woman who showed me how wrong i was breathing post a life as a ‘yoga-file-miss-stretchy-bendy’ & had no-one ever pick up my incorrect breathing and muscle use..) has focused her career on disseminating proper breathing technique…So important!! 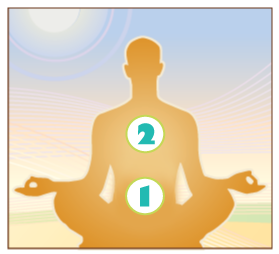 One of the Five Principles of Yoga is Pranayama or Breathing Exercise which promotes proper breathing. The Yogis realized the importance of an adequate oxygen supply thousands of years ago that is why they developed and perfected various Breathing Techniques that will help to revitalize the mind and the body. Proper Breathing in a Yogic point of view is to bring more oxygen to the blood and to the brain, and to control prana or the vital life energy. These techniques have also proved to help the prevention of major diseases and cure minor illnesses. I love, love LOVE this article and it goes in line with what I intuitively taught (then studied with multiple teachers) and how breath helps us move the body better. I just wish the people making the very well constructed diagrams knew the difference between “then” and “than”. Since taking a hypopressive technique training I have been doing some more research into belly breathing, why we are doing it, the damage it can do on the pelvic floor and the language used around it. Your article has been very helpful! To your chart — I would add that the pelvic floor moves in sync with the diaphragm and so therefore if we are focused on the belly breath in a forceful way — there might be too much pressure downwards on it and it can be the cause or insult to injury in pelvic floor dysfunction. Very good article. I have been trying to research this and this article explains it in a very nice way. What I am wondering, is when you go to exhale, which direction would you focus on. If you are inhaling starting from the chest to the belly, would you reverse this and exhale the opposite direction, as in from belly to chest?